I enjoy pulling these "one-pot-wonder" pasta dishes out of my bag of tricks every now and again, because they are super simple to prepare, fun to experiment with different flavor combinations, and always pretty darn tasty. This batch was no exception. All the simplicity and fun comes from placing all the pasta ingredients in the pot at the same time. The dried noodles, seasonings, beans, and veggies all fill the pot with about 6 cups of water, once the pot is comes to a boil, cook it 10 minutes or so, the way you would any pasta. It is still exciting to me that this works every time! I also like that I can throw a bunch of stuff in a pot and confidently walk away, so that my hands are free to do other things. Say, toast champagne and enjoy time with friends! 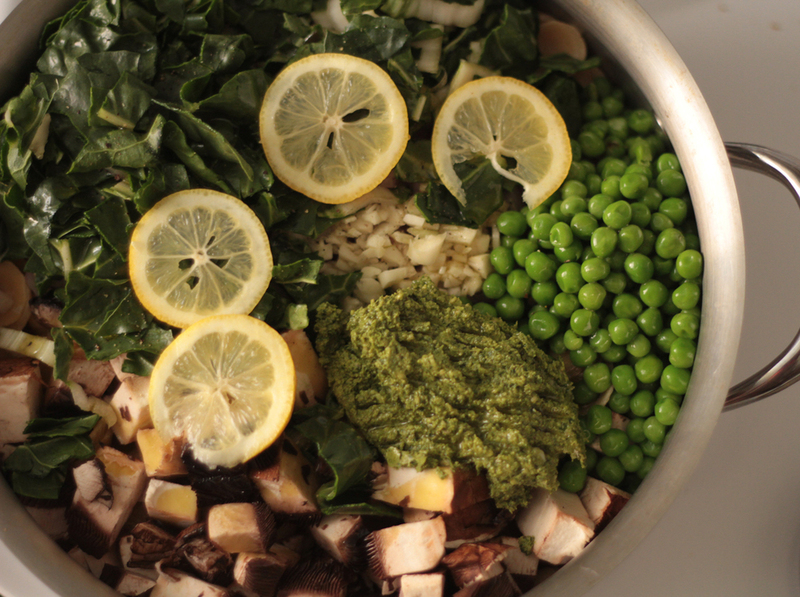 For this one-pot-wonder, I chose to do a "spring" edition with lot's of fresh baby spinach and kale leaves, green peas, and swiss chard. Plus, some pesto. 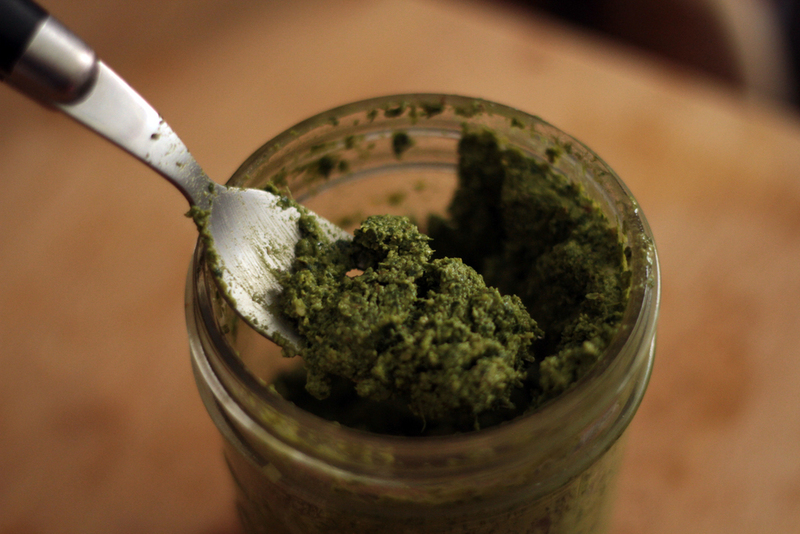 Parsley pesto! 1. To make up this bad boy I packed all of the ingredients into a blender, you could use a food processor too, and blended. It is smoother sailing if you drizzle the oil in while whirling everything else through the blender. I am a huge fan of parsley---and for reasons that go way beyond a garnish. Parsley is quite nutritious, an anti-inflammatory, antibacterial, antioxidant rich food. It is a great liver and blood tonic, and freshens the breath to boot. Plus, it is very easy to grow and pretty prevalent, especially in those pre-basil days of spring and early summer. So while you are waiting for basil to pop up, go get your hands on some parsley and try out this incredibly fresh take on pesto. For this pesto I used a little bit of mint and lemon, which added to the spring time freshness of it all. I also used walnuts, which was good, though I kind of I would have used a greener tasting nut. Something like a pistachio would have been out of this world I think. Dare to be adventurous with your nut choice here! I think any number of combos would work nicely. You could also go wild and add in some cheese, and nice pungent parmesan would be divine. This will make about 2 cups of pesto, so you will have some left over. Try it spread on toast with avocado or cream cheese. Or make a quick supper by adding to fresh hot pasta or cooked rice on a night when you just don't feel like dealing with dinner. You know, one of those night when you just want to drink champagne instead! Empty pasta into a large pot or deep skillet with a lid. Add all the other ingredients to the pot, be generous with the pesto. Add about 6 cups water and bring to a boil. Once boiling, let cook about 10 min, until pasta is tender. Most of the water should be absorbed. If it gets too dry add a bit of water so that the mixture is saucy, but not soupy. Remove from heat and enjoy! Would be extra tasty with some parmesan sprinkled on top and more fresh ground pepper! Enjoy your this one pot wonder, and do experiment with your own flavor combos! I will say a pad thai works well with this method too--if that gets any creative juices flowing.